Don’t moan, organise 1: the problem re-stated | Cornwall – a developers' paradise? Exactly a hundred years ago American labour activist Joe Hill, facing execution, urged supporters not to mourn, but to organise. In Cornwall these days, many mourn the loss of our countryside and heritage. Campaigners are also very likely to moan at Cornwall Council, for colluding with developers. At the same time, councillors moan at the Government for rigging the rules so blatantly in favour of developers. But perhaps it’s time to stop moaning and start organising. In June, councillors at the Council’s Strategic Planning Committee gave outline planning permission for 750 houses at Bodmin and another 455 at Newquay. This followed another more shambolic meeting back in March when permission was given for 950 houses at Truro in a single meeting. Neither set of decisions came as a surprise. At both meetings schemes had been recommended for acceptance by planning officers who had been working closely for months, even years, with the developers concerned. In the case of Bodmin and Newquay the plans were part of larger ‘masterplans’ to increase the size of these towns by up to 40% over the next generation. Cornwall Council could hardly start turning down plans it had been enthusiastically pushing forward a few years earlier. What was more depressing wasn’t so much the failure at this meeting to stop the juggernaut of urbanisation that’s wiping out familiar landscapes and countryside on the edges of most Cornish towns (and some villages). No, it was the level of the debate. Councillors were deflected onto the minutiae of the building projects – road layouts, proportions of so-called ‘affordable housing’, potential planning gains and so on. In doing so, they not only lost sight of the wood, but could scarcely get their noses out of the undergrowth long enough to spot the trees. No-one argued against the principle of continuing a strategy of massive housing growth in Cornwall. 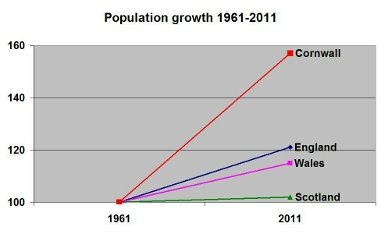 This growth has resulted in a 57% rise in the population of Cornwall in the half-century since 1961. Compare this with a 20% rise in England over the same period, 14% in Wales and just 2% in Scotland. No councillor called for an end to this glaring disparity and a breathing space for Cornish communities. By not doing so they effectively accepted that rapid population growth rates in Cornwall will not only continue; they’re being locked in and ramped up. We’re in a mess. And all that’s on offer is more of the same. Cornwall Council’s Local Plan proposes a minimum target of 47,500 houses in the years from 2010 to 2030. This is the equivalent of building five or six brand new Truros. A rate of growth of this magnitude merely carries on the build rate of the past 15 years and projects it into the future. To add insult to injury this mindless ‘strategy’ can’t even provide decent and affordable housing for those who live in Cornwall. Despite increasing our housing supply at a rate much faster than elsewhere since the 1960s we’re told we still have a housing crisis. Clearly, the number of houses built is no simple panacea for that particular problem. Indeed, in a solely market-driven context, it may be part of the problem. Even this proposed rate of growth is not enough for the developers who unite in demanding much higher targets. They of course have a vested interest in doing so as the higher the target, the easier it becomes to get planning permission. The role of developers is not unexpected, as their special pleading makes perfect sense from their perspective. However, over the last couple of decades, the planning game has become more heavily rigged in favour of developers and away from local communities. In blatant 1984 fashion, the previous Tory/Lib Dem Government’s lip service to ‘localism’ in practice coughed up a strategic planning framework designed to define virtually any ‘development’ as ‘sustainable’. This has made it extremely difficult for local planning authorities like Cornwall Council to reject major residential planning applications. If that wasn’t sufficient to bring local councillors to heel, central government has another trick up its sleeve, in the shape of the planning inspectorate. One of the tasks of this team of enforcers is to move from one Local Plan examination to the next, upping the housing targets. Meanwhile, others preside over planning appeals, which almost invariably (although not always, as that would entirely undermine their flimsy legitimacy) find in favour of the big developers who appeal against refusal of major planning applications. Oddly, most appeals from individuals get dismissed. All of this makes the job of local councillors a difficult one. 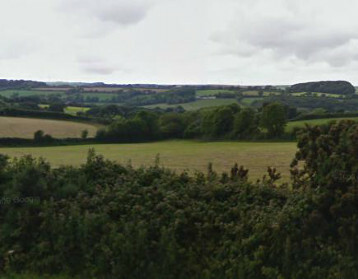 That said though, in Cornwall there’s precious little hint of any desire to confront developer-led planning. When the outgoing Chief Executive, Andrew Kerr, blithely stated that “We live in a developer-led world. We’re dependent upon developers coming in and saying they’re going to build houses … we are not in control of our own development” no councillor raised an eyebrow and there was no storm of protest in the local media. Cornwall Council’s planning department can be described by lawyers at the High Court as having a ‘systemic problem’. Nothing happens. Insulting our intelligence, the Chief Planning Officer conjures up the ludicrous claim that new housing produces no net in-migration to Cornwall. Yet we hear no outcry of protest from our councillors at this blatant misrepresentation. Clearly, we are not being well protected from the consequences of developer-led growth by our elected representatives. Why are most of our councillors so feeble? Why do they tamely accept a developer-led ‘vision’ that bears an uncanny resemblance to the future sketched out in Orwell’s dystopian 1984 – ‘a boot stamping on a human face – forever’, except that in our case it’s stamping on our environment, our heritage and our communities – forever. Doubling the housing stock in 50 years patently hasn’t solved our housing problems or pulled the Cornish economy out of the doldrums. But the only answer on offer is to have a bit more of the same to see if it works this time! One reason for the paralysis of councillors in the face of this mad logic is the lack of an alternative to the depressing brave new old world of the developers. Another is the mind-numbing but universal contemporary acceptance of a market-led and destructive neoliberal ideology. However, these are not the only reasons. Also resulting from the neoliberal project of the Western political elite, we have a context of massive cuts to local authority budgets. As councillors see their budgets dwindle, they become vulnerable to arguments that more houses bring more money (in the shape of the government’s New Homes Bonus) and more indirectly in a higher population and a larger council tax base. No matter that more housing also brings more people, who then compete for jobs and access to constrained health and educational provision. The truth is that, if we were building just for the existing residents of Cornwall the housing requirement would be much, much lower. This fact is rarely made public either by planners or councillors, who repeat the mantra of ‘local needs’ rather than dare mention that the vast majority of new housing goes, directly or indirectly, to meeting external demand. All this and more predisposes councillors towards developer-led planning and makes them unable to challenge the de-facto project to cram a million people into Cornwall by the end of this century and make it identical to anywhere else in this overcrowded island. Far from seeking to protect Cornish communities from this process, Cornwall Council either enthusiastically eggs on the developers, as did the Tory-Independent administration from 2009 to 2013, or impotently moans about its inability to influence a process imposed by central government (as does the current Lib Dem-Independent administration). A series of scandals, incompetent decisions and disorganisation, a tendency to ride roughshod over local opinion, and what can look like enthusiastic collaboration with (mainly) upcountry mega-construction companies and rapacious developers have led to the appallingly low regard in which Cornwall Council is now held. Many have concluded that Cornwall Council is not fit for purpose. While the chief officers appear incapable of envisaging anything beyond the developer-led world they tell us we live in, a few councillors actively push developer-led planning, seemingly delighted to support any and every mass housing scheme. On the other hand, most councillors uneasily watch as our towns and villages are transformed and as they sprawl into the surrounding countryside, destroying cherished local landscapes for ever. Yet they are rendered impotent by indigestible masses of highly technical paperwork which avoid the key issues, a drip feed of disingenuous and sometimes frankly ludicrous pleas from planners and developers about the ‘need’ for housing and an inability to think long-term. Indeed, a key councillor responded to one campaigner by telling him that as they only had to plan for a 20 year period what happened after that wasn’t their concern. This appalling short-termism and lack of imagination is probably widespread. It’s not that councillors have been captured by developers, even less that they’re in receipt of backhanders – although the ubiquity of that claim should tell them something. It’s that they’ve been co-opted into the developers’ discourse and the growth fetish peddled by government. Even councillors who have tried to stem the rush to house a million people succumb, focusing on the technical details. This is exactly the ground the planning officers prefer, looking through a microscope rather than a telescope. Furthermore, it’s no good councillors complaining that campaigners fail to understand or recognise their attempts to achieve small gains in committee. They need to communicate those efforts more effectively to the public and lend a hand to help link the handful of councillors prepared to confront the implications of developer-led growth with the growing number of campaigners at the grassroots. At present however, we have no such network. This allows the leaders of the council to dismiss local opposition as just a few nimbys and grumblers. However, as Cornwall is subjected to a process of de-Cornishization, its communities re-engineered and its countryside ransacked in the drive for profit, a growing number of voices are being raised in protest. Change is in the air, anger mounts. The issue now becomes the best strategy for the future for those who have concluded that we cannot afford to continue this insane and unsustainable growth project. How might we channel the righteous anger of the people at what is going on around them into effective action? This entry was posted in action, alternatives and tagged organise. Bookmark the permalink.